An elegant pair of brocaded silk buckle shoes, with leather sole and carved wood heel, were London-made by John Hose & Son, c. 1760 and likely worn by an American bride. Hose shoes were incredibly popular in British-America, and will be discussed in my forthcoming book.They are housed in the collection of the Daughters of the American Revolution Museum (DAR Museum). These shoes are believed to be the wedding shoes of Elizabeth Lord. She was born in 1735 in Lyme, CT, and married at the age of 25 in 1760 to Jared Eliot in nearby Killingworth, CT. 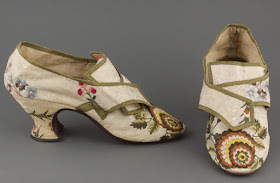 Note the excellent pattern matching at the toes which is evident in a number of surviving Hose shoes, such as this pair in the collection of Historic New England. 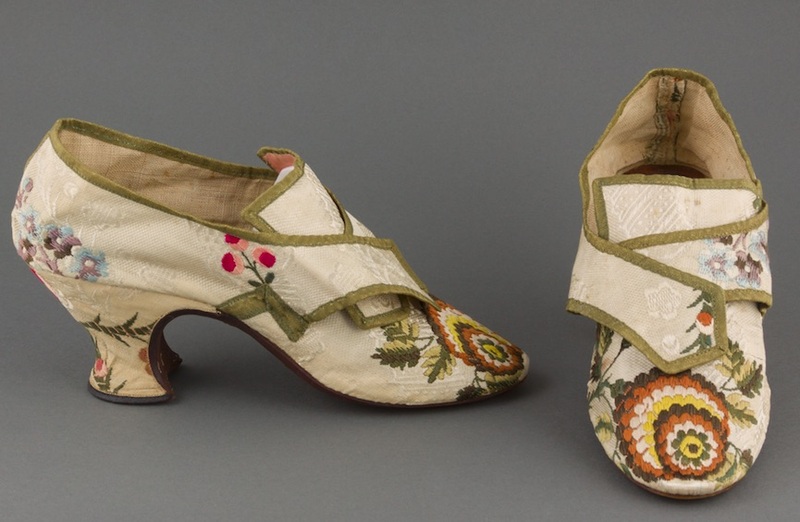 Similar in design aesthetic, the HNE brocaded silk buckle shoes feature a two-inch French heel, oval toe and bright polychrome florals, London, c. 1770. The owner is currently unknown. Pattern matching on toes and heels indicated a particularly expensive shoe as creating the upper required more of the costly fabric than if it was pieced together from smaller bits. The author thanks Curator Alden Tullis O’Brien, and Assistant Curator/Associate Registrar Carrie Blough, of the DAR Museum, for their assistance with the shoes.